Perched on the hillside in beautiful Airlie Beach in Tropical North Queensland you will find Blue Horizon Resort Apartments. This apartment style accommodation sits in a great location with wonderful views across the marina and out to the ocean. 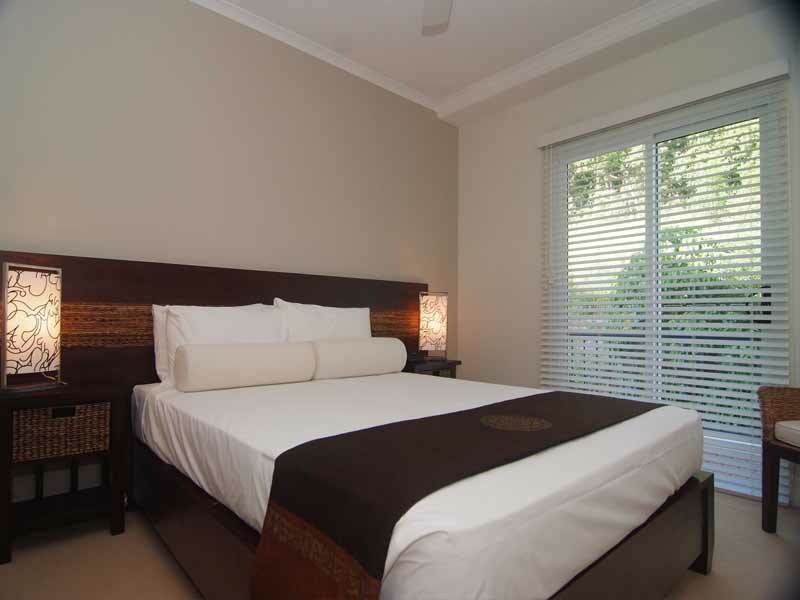 It’s just a short stroll to the beach, local shops and all the amenities that Airlie Beach has to offer. It’s such a perfect spot to use as a base for exploring the amazing Whitsunday Islands and stunning beauty of the Great Barrier Reef. 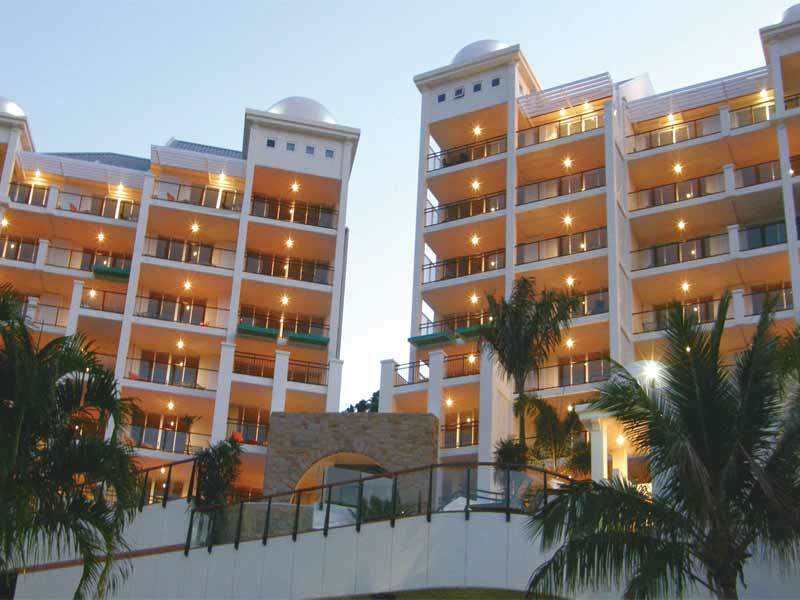 Blue Horizon Resort Apartments offer self-contained accommodation with 54 apartments ranging from 1 to 4 bedroom options, so you are sure to find something to suit your needs, whether you are a couple, a family or a group. The resort has a 15-metre outdoor pool and heated spa for you to enjoy with plenty of large shady umbrellas and sunlounges for you to unwind and relax in. There is also a children’s wading pool that is a safe environment for the kids. When you’re in the mood for a workout, there is a gym featuring cardio and weight bearing equipment. You’re just a short walk or taxi ride from some world-class restaurants and lots of bars and nightlife options that Airlie Beach offers. A leisurely stroll also takes you to the golden, sandy beach or lagoon where you can relax and soak up the beautiful Queensland sunshine year-round. Why go to Blue Horizon Resort Apartments? 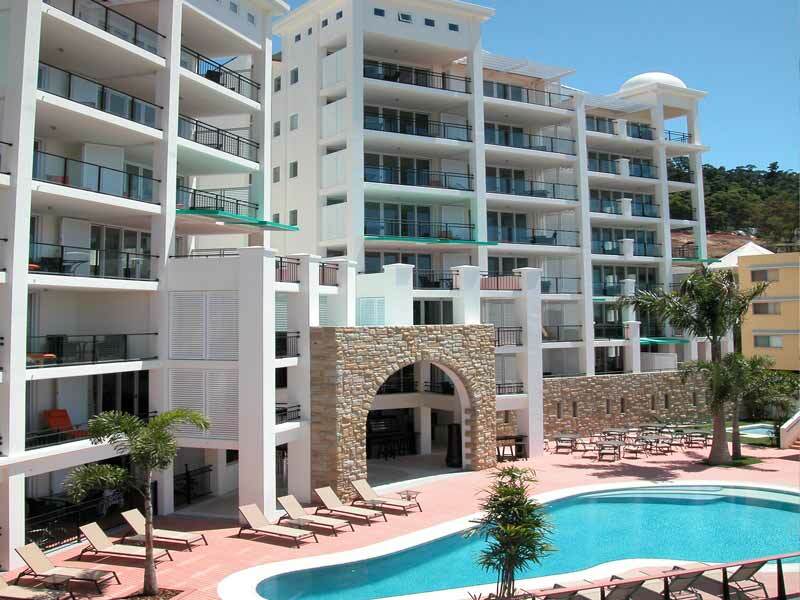 Blue Horizon Resort Apartments have a wonderful position in Airlie Beach, with stunning views across the marina and the crystal-blue waters of the Coral Sea. You are close to everything that you could possibly want while on holiday and will find getting around in Airlie Beach quick and easy. It’s also a fantastic place to base yourself if you want to experience the Whitsunday Islands and the Great Barrier Reef. 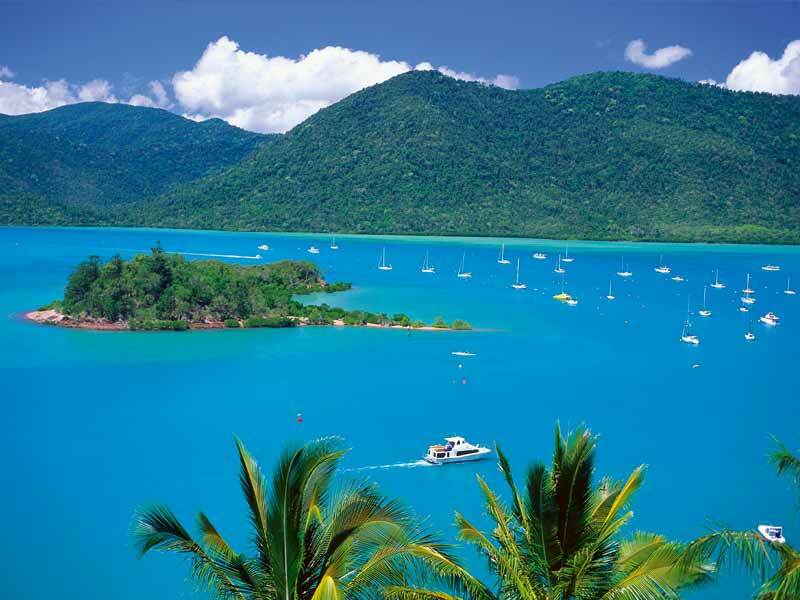 Airlie Beach has such an infinite range of things to do that it is certain there will be something to suit everyone. This modern apartment has been designed in an open plan format with a focus on maximising the incredible views across the magical blue waters of the Coral Sea. Sit on your private balcony or relax in a sun lounge and enjoy the cool sea breeze as it floats up the hill from the ocean below. If you need a change from the warm Queensland weather, you can turn on the air-conditioning and transform your room into your own cool oasis. Relax and enjoy the flat-screen TV and access to cable TV channels. Your apartment is self-contained with a fully-equipped kitchenette and laundry. You have a Queen-size bed in the separate bedroom and the added bonus of a spa bath in your deluxe bathroom. This spacious apartment has a modern and comfortable design that considers both your comfort and also the opportunity to capture the magical ocean views wherever possible. With a Queen-size bed in the 1st bedroom and Twin bedding in the 2nd bedroom, you can comfortably sleep up to 4 guests in this open plan apartment. Your private balcony provides you with a great spot to relax and enjoy the perfect northern Queensland weather and take in the incredible views over the sparkling Coral Sea. Your apartment has been designed to be self-contained, with laundry facilities such as a washing machine and dryer and also a kitchenette that has a convection microwave oven, refrigerator and toaster. You also have tea and coffee making facilities. The apartment has reverse cycle air-conditioning to keep the temperature exactly how you like it anytime of the year and also comes with a flat-screen TV, access to cable TV channels and a spa bath. Airlie Beach is a resort town located on Queensland’s Whitsunday Coast, right on the doorstep of the incredible Whitsunday Islands and the Great Barrier Reef. Your options for travelling to Airlie Beach include driving, taking the train or bus, with multiple options available depending on your department point. When you’re flying to Airlie Beach, you can fly into Proserpine then take one of the regular shuttle buses or fly to Hamilton Island and take a ferry back to the mainland. 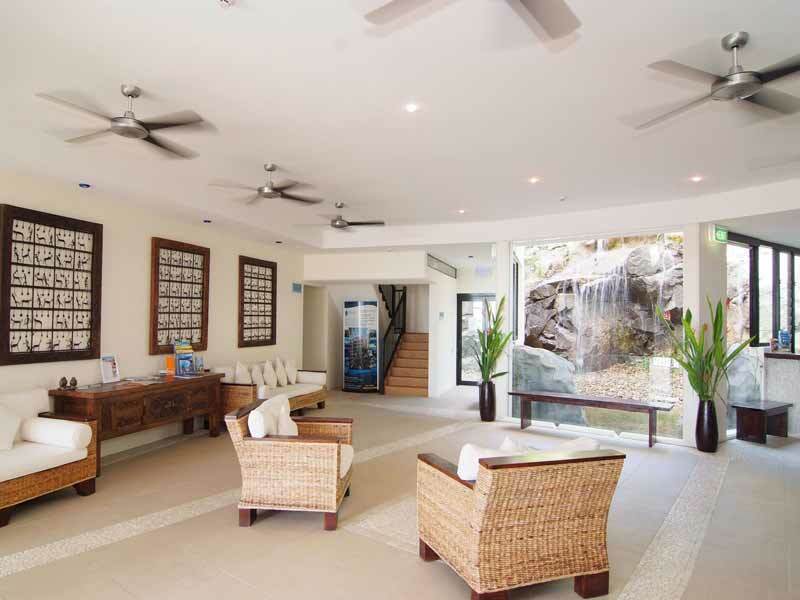 Blue Horizon Resort Apartments is just to the east of the busiest part of Airlie Beach and is set ideally up the hillside so guests can relish great views and experience cool sea breezes. Because Airlie Beach is a resort town, it has an almost endless range of things to do and try, it’s really a matter of what you might enjoy. Airlie Lagoon is a great spot to visit with the man-made lagoon being a safe area for families to enjoy, plenty of grassy and shady areas as well as shops and cafes close by. It sits right beside the ocean so you can also reach the beach just steps away. You can visit the Airlie Beach markets every Saturday and find a great range of things for sale, including locally produced goods and home-grown fruit and vegetables. Airlie beach is a great base for taking a day trip out to the Great Barrier Reef to experience the magical underwater world full of huge coral colonies and an abundance of fish and other marine life that live on and around this natural wonder. Explore the Whitsunday Islands on a boating cruise with many different destinations on offer or, if you want the ultimate in relaxation, why not enjoy a sailing cruise through the calm Whitsunday waters? You are certain to find something to keep everyone busy in this small town that is packed with things to do. The rooms were awesome with great views. Very clean and staff are always friendly and helpful. The resort has a great pool and BBQ area and a gym (better than most other places). It’s only across the road from the marina where ferries drop off and pick up from your daily trips across the waters. Will definitely stay there again!